Great news from Life Skills Support! Congratulations to Linda Moscaritolo, Maura Reck, and Linda Henning for a Job WELL DONE! They have / continue to collaborate with Wilson Area HS Admin and Staff to produce this AWESOME video showcasing our students maximizing their potential as vital members of the Wilson HS school community! The linked video highlighting our students' abilities and inclusion into the Wilson HS school community is scheduled to be shown to the entire Wilson HS student body during the daily morning news cast on Wednesday March 6, 2018. Additionally Linda and her team have sold over 54 t-shirts already and are set to sell bracelets over the lunch periods on Wednesday March 6, 2018 to further promote inclusion and ability awareness! Thank you Linda, Maura, and Linda for your leadership, dedication, advocacy, collaboration, and drive to provide innovative inclusive opportunities such as these for our students to showcase their strengths and to get them involved in their school community and beyond! Julie, we got permission to get this video out on our Social Media platforms! The video has already been shared with the students and their families! Great Work everyone!! Onward! 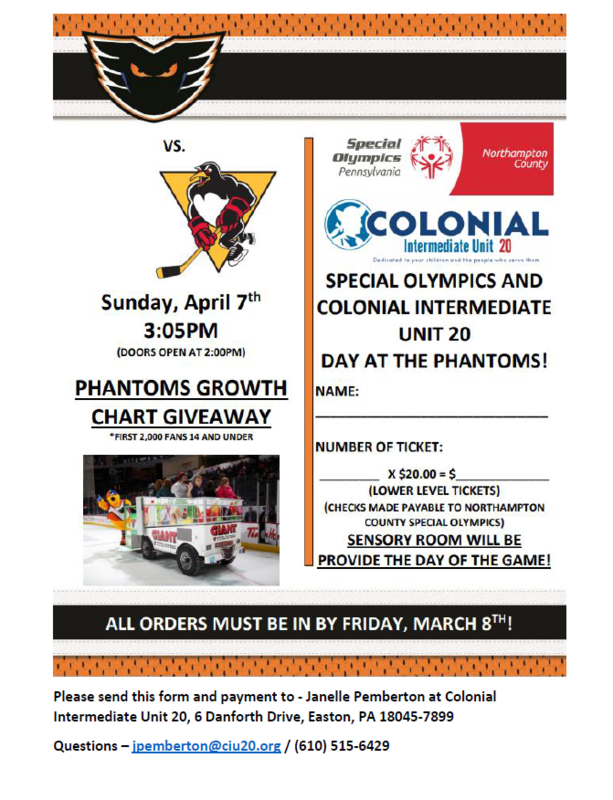 Spread the Word to End the Word - Wilson Area HS - "Possibilities Program"
Join us on Sunday April 7th @ 3:05pm at the Lehigh Valley Phantoms Hockey Game. NCSO is selling tickets for this event as a fundraiser. Tickets are $20 each. Please complete the attached order form and return to Janelle Pemberton at IU 20. Address and contact information are listed below. 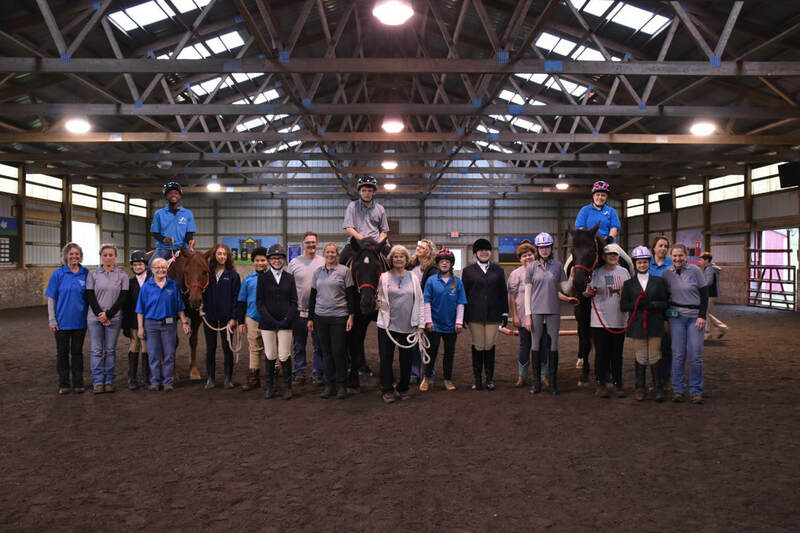 The Northampton County Special Olympics equestrian program is designed for athletes to develop skills for COMPETITIVE horseback riding. This is not a therapy program. Participants attend a minimum of 10 training sessions followed by a NCSO local horse show. 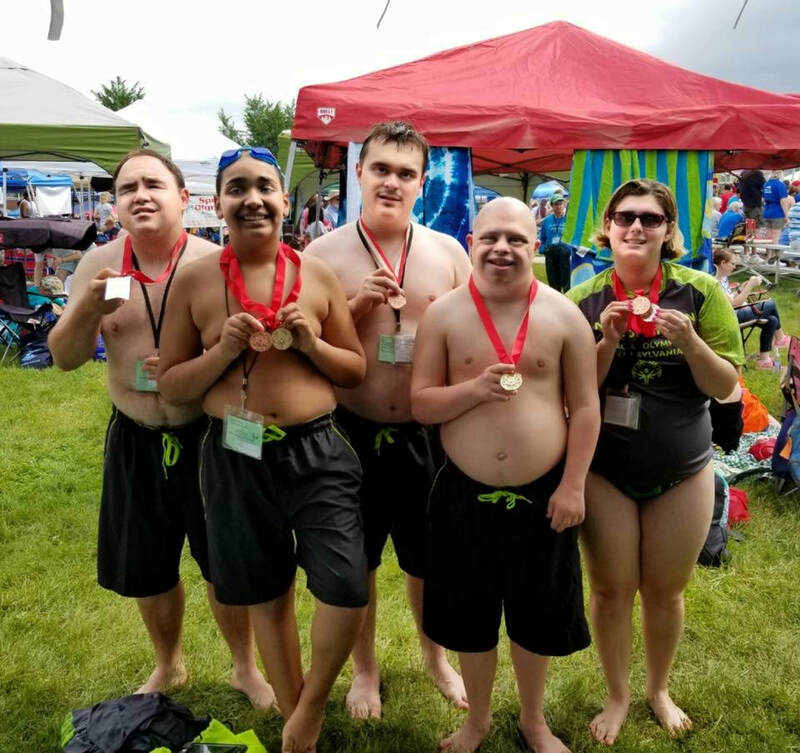 Athletes may be considered for participation in the PA Special Olympic Summer Games held at Penn State University. Due to the nature and cost of this activity, slots are limited. Should an opening become available, replacements are selected based on many factors (examples: skill level to match opening, horse availability). If you have questions contact equestrian coach Linda Lechner LLechnerNCSO@gmail.com. Northampton County Special Olympics will be holding a Yankee Candle Fundraiser to help cover the cost of our four bowling tournaments and all of the bowling trainings for over 800 athletes. The fundraiser will run now through November 12, 2018. All of the items will arrive before Christmas! Use Code: 999986223 so NCSO gets credit. We appreciate your support in helping our program continue to grow! 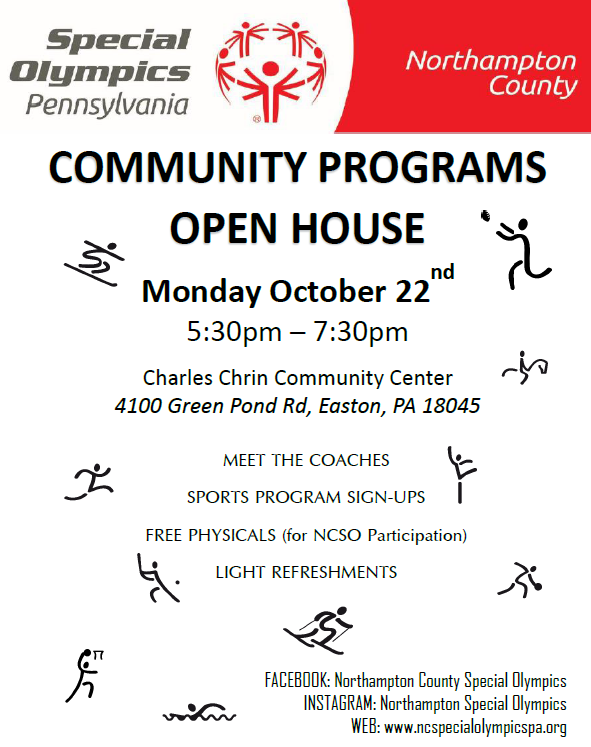 Please join our Northampton County Special Olympics Coaches and Volunteers for our annual open house and free physical night! The purpose of the Open House is for families and athletes to learn more about our School Based Program and our Community Based Program. We will have all the necessary forms at the Open House for your athletes to compete and train in various sports for our 2018 -2019 programs. Coaches will be available to answer any questions and to sign up your athletes for the various sports throughout the entire year. Please share with any families that may be interested in joining Northampton County Special Olympics. 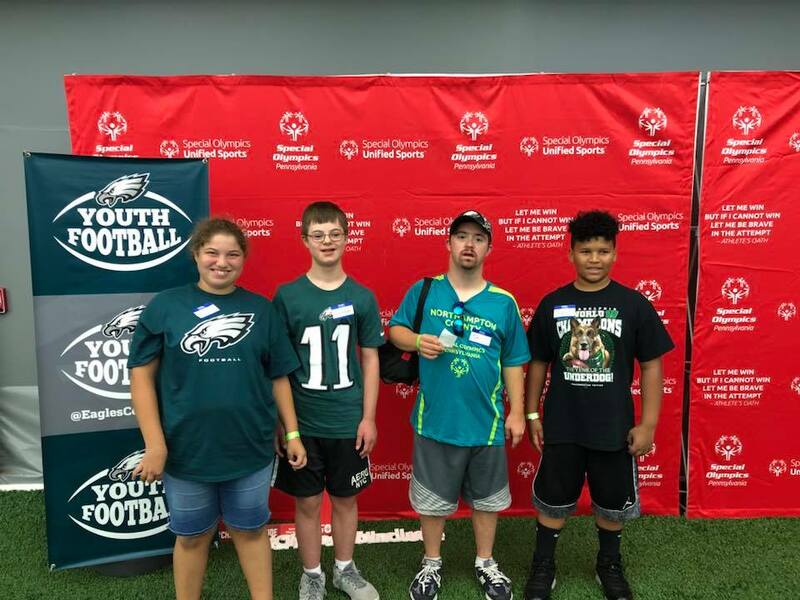 I was one of four athletes from Northampton County that went to the NovaCare Complex on September 4th. This is the indoor practice area for the World Champion Philadelphia Eagles! We got to run through drills like the Eagles do. I had to step over hurdles, run around barriers, and crash through the tackling pads while running with a football. Four players from the Philadelphia Eagles team were there and cheered us on and tried to stop us as we ran through the drills. We also got to see a flag football game between two counties from the area. Swoop, the Eagles mascot, was there to cheer us on as we ran through drills on the same field that the Eagles practice on. But the best part of the night was getting to see three of the Eagles Cheerleaders, and I even got a picture with them! We got an Eagles Pennant,drawstring bag, water bottle, and a boxed meal before we left for home. But, I was really hungry after our long drive and running though all of those drills that we stopped to eat at a restaurant on the way home with Miss Amanda! Fly Eagles Fly!!! 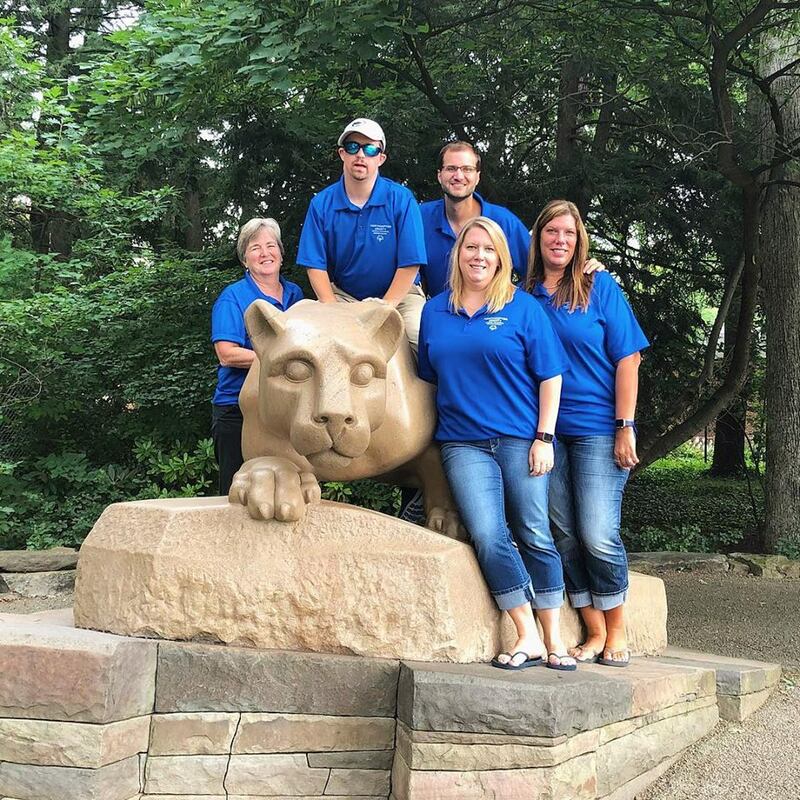 ​This year four staff members, Matthew Krauss, Janelle Pemberton, Pamela Younkin and Amanda Sechrist, along with athlete representative Tyler Youngkin attended the 2018 Special Olympics Pennsylvania (SOPA) Leadership Conference Saturday, August 25th - Sunday, August 26th at The Penn Stater Hotel and Conference Center in State College. The conference offered Q&A meetings, Athlete Congress, Competition paperwork, Vsys updates, information on both volunteer and athlete recruitment, and of course networking and socializing with other programs. The staff attended the Leadership University Graduation Ceremony and Leadership Awards during a banquet. All staff had a relaxing time and worked to bring fresh and exciting ideas back to our local program. 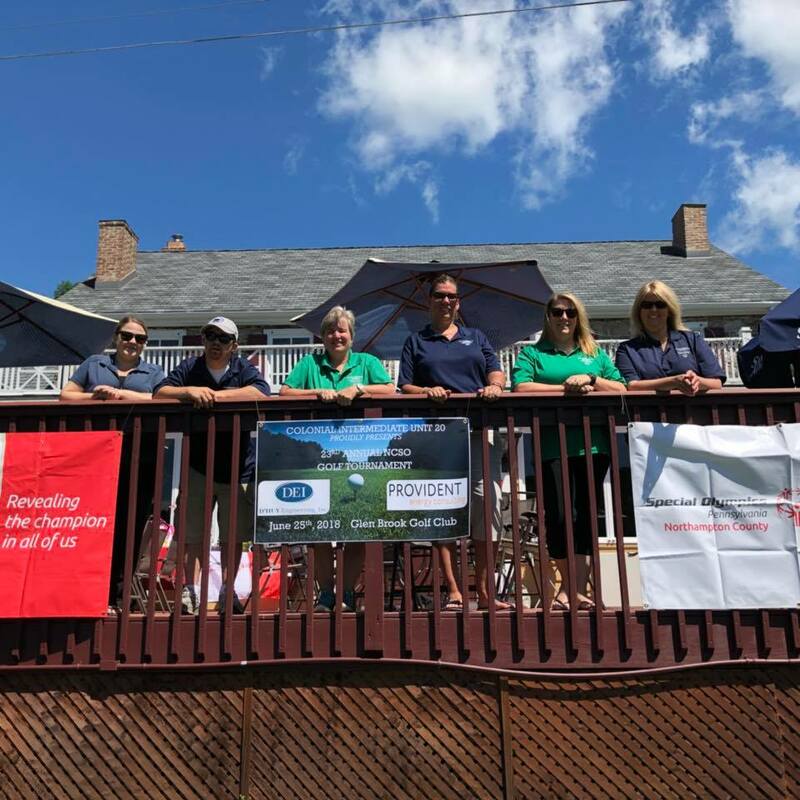 ​On June 25, 2018 Northampton County Special Olympics in partnership with the Colonial Intermediate Unit 20 held it’s 23rd Annual Golf Tournament at Glen Brook Golf Club in Stroudsburg, PA. Twenty Teams tee’d off at 8:00 a.m. to raise money for Northampton County Special Olympic Athletes. At the conclusion of the tournament a luncheon and awards ceremony took place, as well as a tricky tray raffle, prizes were donated by volunteers and local businesses. The money raised at this event helps with the cost of Summer State Games held at Penn State University. -June 2nd. We are so proud of you all!! 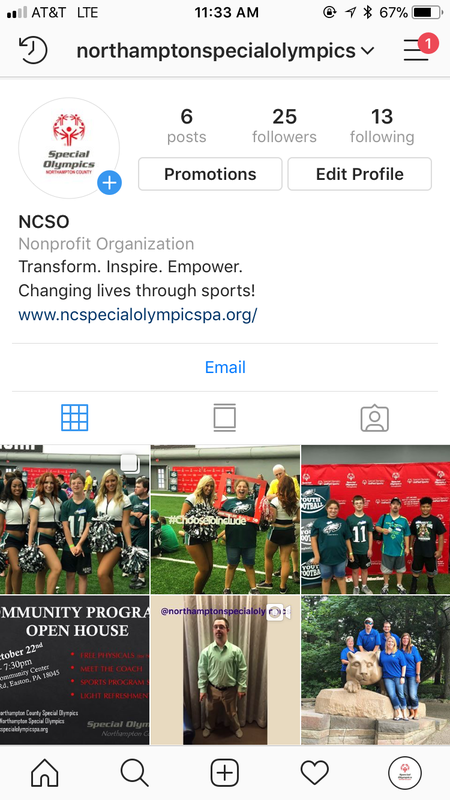 NCSO is now on Instagram. Be sure to check us out at "Northampton Special Olympics". We will be adding pictures of various events and fundraisers throughout the year. We encourage you to use #ncso when posting pictures of events and tag us! ​Over the last few months, athletes from 22 Northampton County classes have been practicing their gymnastics skills. They worked very hard with the help of their classroom and gym teachers to learn routines in floor exercise, balance beam, and the vault. 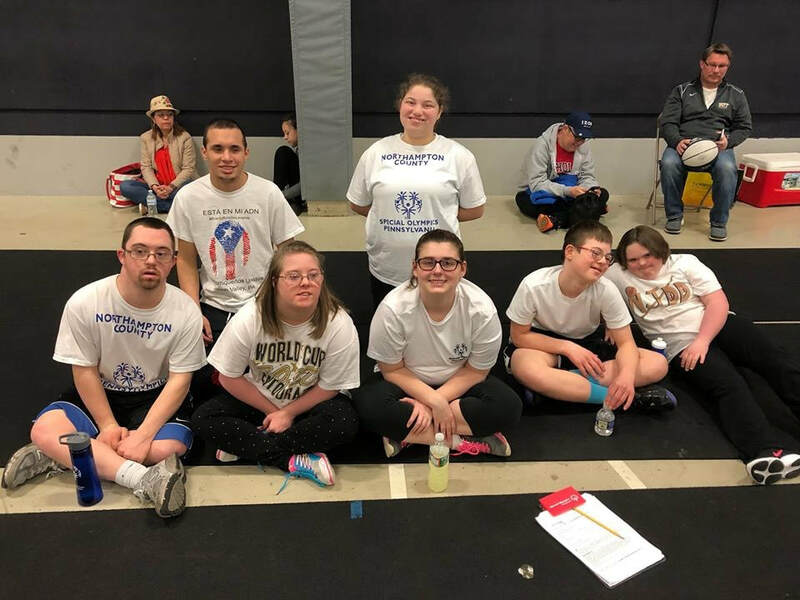 After much anticipation, and 2 unexpected snow cancellations, the Special Olympics Gymnastics competition took place on Monday March 26, 2018. Easton Area High School hosted the 13th annual event. 165 gymnasts came ready to show their families, coaches, friends, and judges all their hard work. The event kicked off with opening ceremonies, and then the routines were on! The athletes tumbled, rolled, balanced, and jumped their way across the mats. Each routine started with the traditional one hand salute, and ended with an enthusiastic "TA DA!". Every athlete was proudly awarded a ribbon for each event. There was no shortage of sportsmanship, as the athletes cheered for their friends on the mats. This event is supported by so many wonderful volunteers. Many thanks to Easton Area High School, Student Council, security, custodians, administration, and student volunteers for your help and support. We are also grateful to the Easton Angels for holding their annual bake sale on behalf of Northampton County Special Olympics. Lastly, a special thank you to teachers and volunteers for your hard work and dedication to the athletes. As always, the event closed with a dance party! It was a fun event and we are looking forward to another great year! 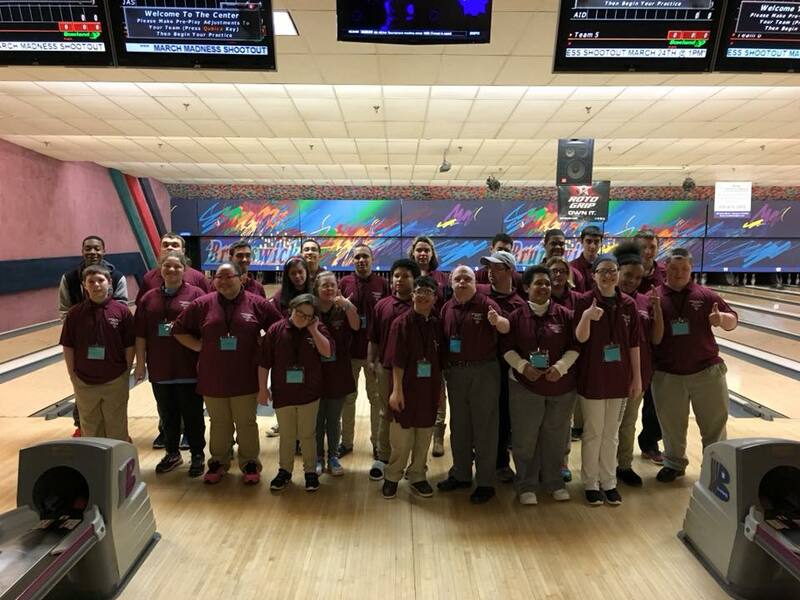 ​This year Northampton County Special Olympics took thirty-one of its’ top bowlers to the Eastern Sectional Bowling Competition held in Allentown, Pa. on March 25, 2018. Under Head Bowling Coach, Janelle Pemberton, the athletes threw many strikes and spares. All thirty one athletes and ten coaches were housed at the Rose Bowl. They each received a new maroon polo shirt to compete in. With the new format from the state, the open ceremonies were held at the lanes with our own Tyler Youngkin giving the opening speech and getting the bowlers pumped up for a fun day of competition. A huge thank you to all of the coaches and families who came out and cheered on our awesome bowlers! 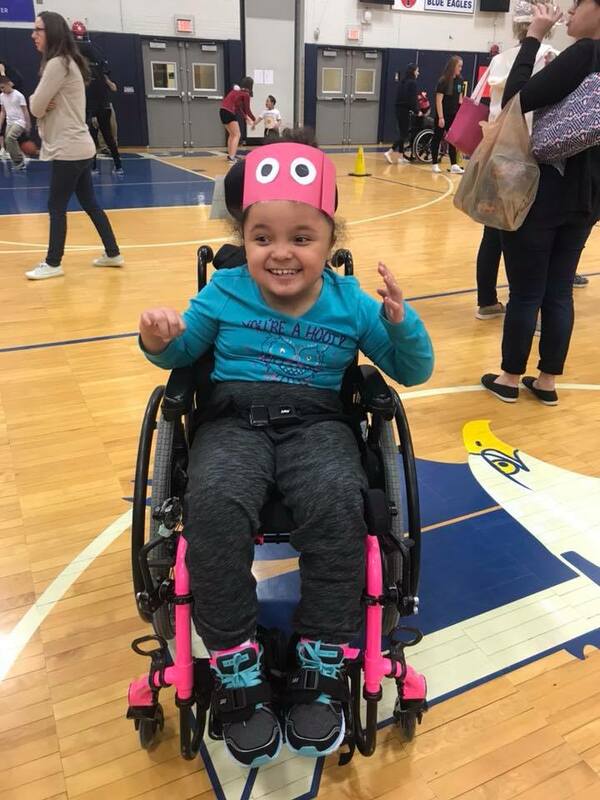 The sounds of basketballs bouncing, balls swishing through hoops, and balls being passed topartners could be heard in the Chrin Center Gymnasium. There were 25-30 athletespracticing their dribbling, passing, and shooting skills each Thursday afternoon for 8 weeks inMarch and April. Spot shooting, serpentine dribbling through cones, give and gos, keepaway, and 3 vs. 3 were just a few of the drills they worked on each week.It was great to see the improvement they made week to week. They worked on 3 basic skillsthat were tested at the start of the training, throughout the training,and at the end of thetraining for the FIT 5 Program. This enabled us to see the improvements they were makingand the goals they were meeting. Our athletes also learned how to take the skills theylearned to play in a 3 vs 3 game. They were able to work together with teammates to pass,shoot, rebound, and play defense.Ten athletes participated in the VIA Shoot Out at NCACC on March 31. They played two 3 vs 3games in the big court in front of a large crowd. Senior All-Stars from the Lehigh Valley werepresent and cheered for our athletes during their games. The highlight of the day for most ofour athletes was getting interviewed by Service Electric TV! They were asked questionsabout how they like playing in front of a large crowd and how they like being there with allthe Lehigh Valley Sr All-Stars! There were smiles galore on all of our athletes faces!For the first time, seven of our athletes participated in a Special Olympic BasketballCompetition at Moravian College on April 22! They played three games against teams fromBethlehem and Lehigh Counties in a 3 vs 3 competition. All of the teams we played againsthave competed at Kutztown and Penn State, and our team did an outstanding job against thestiff competition! This was a great learning experience for our athletes and for the coaches.But the best part of the day was seeing all the smiles, high fives, and hugs between theathletes; the pizza they served after the games wasn’t too bad either! Looking forward tonext year and seeing what our athletes will accomplish!